Since software release VB15A, Siemens supports the real-time export of Dicom mosaic images (one file per functional volume). The recommended way by Siemens to turn this functionality on is to use the IDEA command tool after switching in advanced user mode on the console computer (see documentation by Siemens). Unfortunately there seems to be a problem since the IDEA command tool does not save the specified settings properly to disk. As an alternative solution, the respective "config" file "C:\MedCom\config\Ice\IceConfig.evp" may be changed manually, or better, by using the "XBuilder" program that can be started using the Windows "Run" tool. In XBuilder, change the three export parameters "OnlineTargetPort" (to "-1"), "OnlineTargetHostName" (to name or IP of PC in network receiving data) and "OnlineTargetPath" (to the name of the folder of the PC in the network, e.g. "D:\rtfmri"). Note that the config file is overwritten each time a new patient is registered, i.e. the settings have to be repeated each time you want to use the real-time export for a new subject. 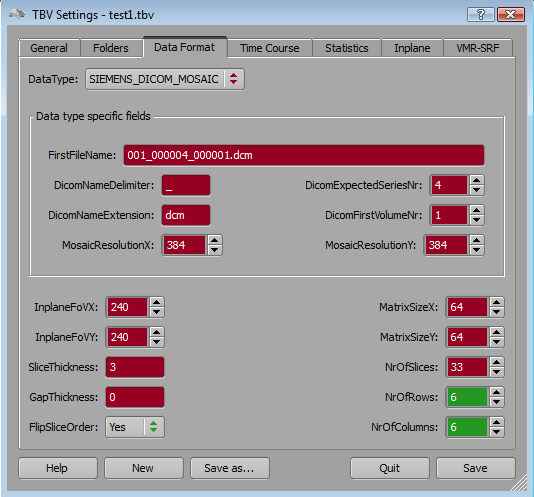 In order to prepare a TBV file to handle the exported Siemens data, you must change the settings in the Data Format tab of theTBV Settings dialog. The DataType box must contain the "SIEMENS_DICOM_MOSAIC" selection. You must also fill in the name of the (expected) first file of the functional data, which is similar to "001_000004_000001.dcm" (set as default). The first part "001" is constant throughout all measurements of a subject including the anatomical "scout" measurements (it is only changed if the same subject is registered in a future session). The second number is the "series" (or "scan") number. The functional data set is series "4" ("000004") and the value "4" must also be set in the "DicomExpectedSerieseNr" field. The third number is usually "1" ("000001") and that number should be set in the "DicomFirstVolumeNr" field (default). This number will change from volume to volume, e.g. "001_000004_000001.dcm", "001_000004_000002.dcm", "001_000004_000003.dcm" and so on. In order that TBV separates the different numbers correctly from the first file name, the "DicomNameDelimiter" must be set to the underscore ("_") symbol (default). Note that one usually needs to change only the "DicomExpectedSerieseNr" (scan) number for the next expected run ("4" in our case) since the other entries should normally not change and are set to correct values as default. If one would, for example, run a second functional run, one should change "4" into "5" in the "Series" field (and in the "FirstFileName" field, but this is not strictly necessary).